�Ebola � Staying Safe,� produced by maritime e-Learning leader VideotelTM, explains the dangers of Ebola and its impact on ships and seafarers. KVH Industries, Inc., (Nasdaq: KVHI) is offering Videotel's new video about Ebola safety free to all mariners worldwide in an effort to increase awareness of the vitally important prevention measures that can keep seafarers safe. Ebola, a severe and often fatal illness for which there is no vaccine or cure, has been ravaging parts of West Africa since March in the largest outbreak ever known. The World Health Organization has declared the current outbreak a public health emergency, and it is critically important that anyone working in the global maritime industry understand the steps they can take to prevent the further spread of the disease. KVH has created a website, www.kvh.com/EbolaSafety, for all mariners to download the free video and an accompanying workbook. In addition, KVH delivered the entire video program today to its IP-MobileCastTM customers on vessels across the globe, who will automatically receive the video for immediate viewing on-board. "This is a perfect example of why it is sometimes necessary to send out urgent training updates without delay and not wait for the annual update process," says Nigel Cleave, Videotel chief executive officer. "The Ebola epidemic is a crisis of worldwide proportions and one where commercial ships and seafarers are at risk given the global nature of their jobs," says Martin Kits van Heyningen, KVH chief executive officer. "Distributing the free video by digital means enables us to get the information to all mariners quickly, especially seafarers who may be in or near a port in the affected region, where it is unsafe to go ashore." "Ebola - Staying Safe" is a 15-minute training program produced by maritime e-Learning leader Videotel, a KVH company, in association with Steamship Mutual P&I Club and a panel of medical and subject matter experts. The video, which includes footage from West Africa and was produced in the last eight weeks to ensure the most up-to-date information, explains what Ebola is, what its symptoms are, and how the virus spreads. It outlines the ways in which crew members can protect themselves, and also what steps masters, ship owners, and ship managers can take to keep crew members safe from harm. 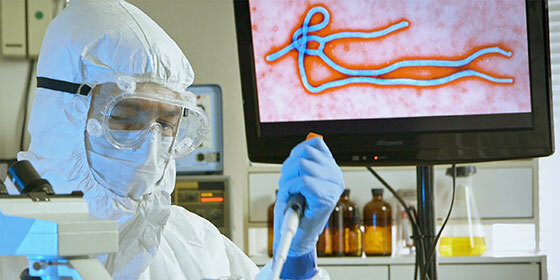 "The Ebola training film covers matters of life and death, much like many of our other programs in our 900-course training library," says Videotel's Nigel Cleave. "It has to be accurate, engaging, and well designed from a didactic point of view so that mariners of all cultures and backgrounds understand it. Our ship owner and ship manager clients are facing Ebola-related decisions every day as their ships approach and leave affected ports and at Videotel our first instinct is to support them." KVH's initiative to distribute the video to seafarers around the globe is company-wide: Videotel is providing the video free as part of the regular updates for its training program subscribers on more than 11,000 vessels; KVH Media Group, a leading provider of commercially licensed news, music, TV, and movie entertainment content for the maritime industry, is directing its customers to the download site; and Crewtoo®, KVH's online seafarer network, is informing its 100,000+ seafarer members via social media. KVH is being aided in its video distribution efforts by seafarer agencies, including the International Seafarers' Welfare and Assistance Network (ISWAN), which is promoting the video to some 450 seafarer centers around the world. KVH provides maritime broadband connectivity to vessels worldwide through its TracPhone® V-IP series satellite communications antenna systems and mini-VSAT Broadbandsm service. Earlier this year, KVH launched the IP-MobileCast content delivery service, which utilizes multicasting technology to affordably deliver news, entertainment, and operations content to vessels at sea.